Simon Marmion (FR. Simon Marmion, approx. 1425, presumably Amiens — 15 December 1489, Valenciennes) — artist and Illustrator, who worked in Northern France and Flanders. Presumably a son of the Amiens artist Jean Marmion. Marmion wrote of the painting, but gained great fame for his portrait miniatures. In this field he was considered one of the most famous masters of his time. Aware of his work with other artists in the center for books arts, Bruges. His style is defined as the synthesis of the North-French school of painting of the Flemish and Dutch areas of the painting. The poet Jean Lemaire de Marmion Belz called the "king of miniatures". His work can be reconstructed on the basis of hypotheses, which today can neither confirm nor deny. It includes miniatures, the most famous of which are miniatures from the Royal library in Brussels, and also in the "Great chronicle of Saint-Denis" (Saint-Petersburg, GOS. The Hermitage). These miniatures is remarkable for its sophisticated style, elegant characters, harmonious flavor; often they depict the scenery. 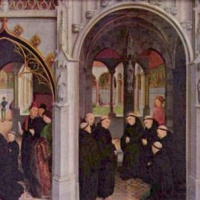 Marmion can be attributed, and fold the altar, commissioned by Guillaume Fillastre to the Abbey of Saint-Bertin in Saint-Omer and was completed in 1459; the two vertical panels "Scenes from the life of St Bertin" (Berlin-Dahlem, Museum), completed two murals of Angels (London, NAT. Gal.). These works stylistically close and several others, whose authorship, however, is not precisely determined ("Miracle of the true cross", Paris, Louvre; "Christ" and "Madonna", ^Strasbourg, Museum of fine arts; "Pieta", new York, Metropolitan Museum, Lehman collection; "the Crucifixion", Philadelphia, Museum of art, Johnson collection; "St. Jerome with a donor", ibid. ).